Undoubtedly one of the rarest parts to source for the C, D, F and J engine and a part which has not been remanufactured for at least 10 years. We have produced our own patterns, we have our own independant gear cutting suppliers using state of the art gear cutting technology and we have achieved our objective to produce a 'spot the difference' product when comparing with the original factory pump. We are the sole manufacturer / supplier of complete J Type oil pumps. 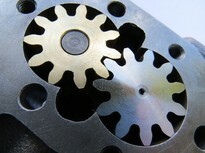 Gears produced on a state of the art brand new £0.5M CNC gear cutting machine with teeth profiles of ground-like (as opposed to hobbed) finish. This is a new standard for MMM oil pump gears. The F type oil pump was a development of the pre-war OHC Morris Minor engine which was similar in many characteristics, the earlier pump incorporating 1/4 inch deep gears and the oil delivery bore within the pump was limited to 5/16 inch diameter. The M Type pump incorporated larger gears to assist oil flow capacity with a depth of 5/16 inch, otherwise these were the same as the OHC Morris Minor oil pump. A larger capacity oil pump with a modified body to include cross-drilled oil ways and deeper gears at 9/16 inch was produced for the F Type and was then also fitted to the production D and J2 types. 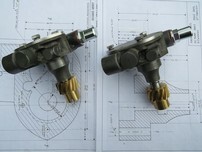 In addition, the oil way intake had its bore diameter increased to 3/8 inch diameter. This third generation pump was then also fitted to the C and J4 although the pinion gear was increased in length to accommodate the extra depth in the front housing which was needed to take the water pump. 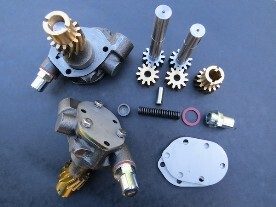 We now offer both the standard C/D/J2 and J4 oil pump gear sets. On assembly, we run each pump up to 1,200 rpm with full oil circulation. 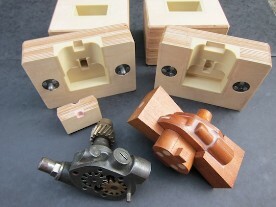 Having produced an initial couple of batches that have all sold, we have completed the majority of machining operations on the body and lid components and so we are generally able to finish machine and assemble within a circa 10 day turnaround. A note to customers fitting new oil pump gears to original pump body castings: it is essential that the customer checks that the pump is assembled with the correct end float. This must not be less than 2000th inch as otherwise the pump will be restricted and will cause the bronze crank/distributor drive gear to fail. End float can be determined through varying the thickness choice of gasket between the body and the lid.